The Harley-Davidson VRSC (V-Twin Racing Street Custom) family of cruiser motorcycles was introduced in 2001 in a single model called the V-Rod. The V-Rod was developed by Harley-Davidson to compete against Japanese and American muscle bikes. 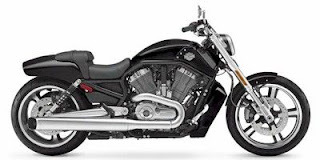 The "V-Rod" made use of the Revolution engine, developed jointly with Porsche that, for the first time in Harley public production history, features overhead cams, and liquid cooling. The V-Rod is visually distinct from other Harley-Davidson motorcycles. It can be easily identified by the 60-degree V-twin engine, the radiator and the hydroformed frame members that support the round-topped air cleaner cover. A distinct difference between the V-Rod and all other Harley production motorcycles, is the location of the fuel tank. The fuel tank on the V-Rod is located underneath the seat, placing the driver on top of it, rather than the usual frontal placement, the "tank" in this place is simple dressing, hiding the frame. Loosely based on the VR-1000 superbike, it continues to be a platform around which Harley-Davidson builds drag-racing competition machines. Model years: 2007–2010. The VRSCAW V-Rod is the successor to the VRSCA. First Produced in 2007, it is essentially a VRSCA with a new frame to accommodate the 240 mm rear tire and five gallon gas tank that came standard. The aluminum bodywork of the VRSCA only made it onto a few early-production VRSCAW models, but was quickly dropped. With these changes the VRSCAW is a claimed 37 pounds (17 kg) heavier than its predecessor. For the first production year the power-plant remained an unchanged 1,130 cubic centimetres (69 cu in) Revolution engine. The VRSCAW is only offered with forward controls. The combination of increased weight, and a 240 mm rear tire with no power increase made the 2007 VRSCAW the slowest production VSRC producedIn 2008 the VRSCAW V-Rod's Revolution was boosted from 1,130 cc to 1,250 cubic centimetres (76 cu in), producing a claimed 84 pound force-feet (114 N·m) @ 7,000 rpm, and peak power of 123 horsepower (92 kW) at the crankshaft, a slipper-clutch was also added, as was an ABS option. For the 2009 model year the VRSCAW replaced the VRSCD, which was dropped from the line, as the "base model" for the VRSC family, as such the MSRP was dropped almost US$2,000 to $14,999.